Richard Young may have won his lawsuit over the yearling he purchased that was discovered to have a congenital heart defect, yet despite the legal victory, the As-Is Clause that governs commerce at horse sales is still very much in place. Despite winning his court case over a yearling he refused to pay for because it was found to have a congenital heart defect, horse owner Richard Young of Boca Raton, FL said the legal victory will not eliminate the As-Is Clause that is the underpinning of the commerce of all horse sales. ALL HORSES ARE SOLD AS IS WITH ALL FAULTS AND DEFECTS. The buying and selling of horses, especially horses purchased to serve as racehorses or broodmares, inevitably involves substantial risk. AS A BIDDER, YOU AGREE TO ACCEPT THAT RISK. THE COMPANY ACCEPTS NONE OF THAT RISK. IF YOU CANNOT ABIDE BY THESE RULES, PLEASE DO NOT BID ON ANY HORSES AT THIS SALE. More on the background of the case in a second. For now, you should know the horse in question, a Well Said filly out of Arts Diva named Eloquent Diva — bred by Brian and David Legge of Ontario — was sold out of the Preferred Equine consignment for $67,000 as hip 17 to Young at the 2013 Standardbred Horse Sale Company yearling sale. Williams is the chairman and vice-president of the sale company, but was commenting on the case not as a representative of the sale company, but on the basis of his legal background and familiarity with the horse business. While Young won the case and did not to have the pay for the horse, the important point isn’t so much the facts of the case, but what the court decision means for horse buyers and sellers going forward. Williams said since it was a civil trial the result provides no legal precedent when it comes to the As-Is Clause. 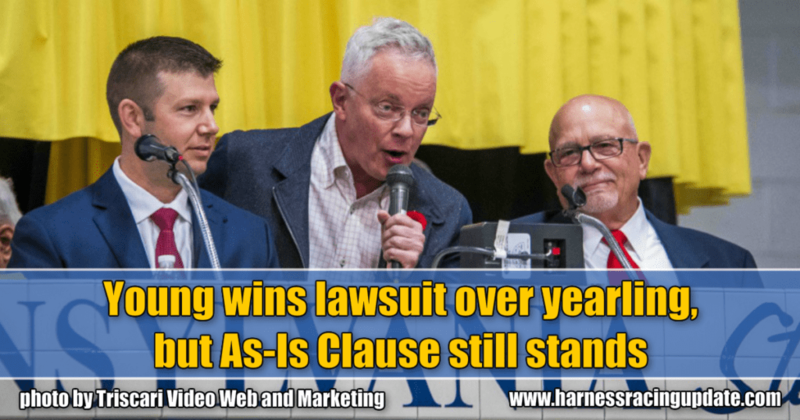 Lawyer and horse owner Andrew Cohen said the As-Is Clause is a well-understood and accepted principle in the horse business. “When you grow up in this industry you’re kind of trained to understand that all sales are final,” Cohen said. “They have the As-Is Clause in all of the sales contracts that nobody reads. It’s at the beginning of all the catalogues and it’s a profoundly significant legal document. It’s a profoundly significant legal contract that you’re getting into when you bid successfully on a horse. Imagine a world where buyers decide a week or two after a sale that they want to return a horse and get a refund — perhaps for reasons of buyer’s remorse, perhaps because once they got a horse home they weren’t as enamored with the horse as they were on sale day. It would, as Cohen said, be chaos. Though the As-Is Clause is still very much in place, the best Young said he can hope for is that it may be amended slightly to allow for unusual cases such as the one he was involved in. “Things like OCDs or possible fractures that you can see with an x-ray, that’s part of the As-Is. That’s what it’s about. But does As-Is go so far as to include organ damage, to include congenital heart problems, to include kidney issues? It should not, because we cannot know and we should not be signing something that says I have to be worried about a heart condition,” Young said. “That went too far. So As-Is clauses should remain the way they are and there should be an additional comment in there somewhere that relates to certain types of conditions that cannot be discovered at an auction. Young said the problem is, a buyer rarely can examine the inside of a horse. David Reid’s Preferred Equine consigned Eloquent Diva to the 2013 yearling sale in Harrisburg, PA on behalf of breeders Brian and David Legge. Though the filly was later found to have a serious congenital heart defect, Reid said Eloquent Diva, “would have been inspected well over 30 times” prior to the sale without the defect being found. He said the filly, born in Harrisburg, PA, would have been inspected by a vet as a foal, would have been inspected by a vet again before being shipped to Kendal Hills Stud Farm in Ontario after being weaned, inspected by both himself, as the consignor, and Standardbred Horse Sales Company representative in the spring of 2013 before being accepted in the sale, inspected again by a vet before crossing the border on the way to the sale and then — as a day one, top-ranked yearling prospect — inspected often by top buyers between the Friday when she arrived in Harrisburg and the Monday when she went into the ring. Despite the horse being examined a lot before selling, as an interesting article in Thoroughbred Daily News attests, the vetting process prior to a horse selling in a sale is far from a perfect one. Young purchased the filly for $67,000. He said the horse was examined by his vet, Dr. Dey, two days after the purchase. Young contacted Standardbred Horse Sales Company president Dr. Pete Spears who agreed Eloquent Diva should be sent to New Bolton. There, Dr. Virginia Reef examined the filly’s heart. “It turned out to be a very serious condition. They rate heart murmurs from 1-to-5 and hers was a full 5. Doctor Reef, who is an expert in heart conditions in horses, maybe the biggest expert in all of the United States, said she had never seen one as bad as it. She gave a diagnosis that the horse would likely die by the time she was five or six. She would deteriorate and die… She died two weeks into her fifth year. “She said it was a condition from birth. She also said, in testimony, they should have found this. And certainly, if Dr. Dey just puts a hand on the horse and finds it in five minutes, how do they not find it in a year-and-a-half? We didn’t argue that (the breeder or seller) knew, because it didn’t matter if they knew. They should’ve known, that’s really what it comes down to. Normally what happens in such cases is a deal is struck and the breeder takes back the horse That did not happen in this case. “We tried to offer a settlement and (the Legges) turned it down,” Young said. “The Legges decided to pursue me anyway. “For someone to want to pursue this in the manner in which they pursued it when even the Standardbred Horse Sales Company said ‘he has a bona fide reason not to pay for this’ (was unusual). So, we have an aggressive attorney and people that want to do this… Truthfully, it should have gotten settled,” Young said. Eloquent Diva was never put into training. “Jesus, I wasn’t going to train that horse,” Young said. “I wasn’t going to have anybody get on a horse where the prognosis is that it’s going to die in a couple of years and get worse and it might die in training and possibly injure somebody,” Young said. Reid said the fact this case went to trial — taking the better part of five years to do so — was highly unusual. That said, he stressed he is always willing to help broker a settlement, if possible. Williams said the As-Is Clause applied in this case because neither the Legges nor Preferred Equine knew the filly had a heart defect. “If a consignor knows about a defect, the As-Is does not apply, but you have to prove that they knew about it. If they are innocent, then you accept the risk when you buy the horse. It’s a high-risk business. There’s nothing wrong with it,” Williams said. “The evidence in the case showed that you had a horse with a heart defect that was not caught. There was no evidence that the Legges knew about it when they sold the horse, so given that nobody in the case testified that there was a warranty – and there has to be evidence that somebody said or wrote something that could constitute a warranty if you read the transcript — there is nothing in there. Therefore, for Young to win, the jury had to just decide, ‘We want him to win.’ Why would a jury do that? The old jury veto. Look at the case. The horse had a terrible heart defect and the guy bought the horse. Even though there was no evidence that the Legges knew about it and it was certainly not the case that Richard Young knew about it, the jury thought that Young deserved to win, so they went his way. “The jury just wanted to do what was fair and, to them, making Young pay for a horse that was seriously defective and actually died before the trial — the poor thing died — they just didn’t think it was right, so they did what they thought was right. Cohen said the verdict likely did not establish a legal precedent, but could be instructive for similar cases in the future. “Does the verdict by a jury in Pennsylvania have precedent? Is this going to be cited if this comes up at a sale in New York or Kentucky? No, I don’t think so,” Cohen said. “There’s no precedential value, but nevertheless it’s instructive. It tells us that when a layperson, who isn’t in our sport, is explained all the rules and was explained this fact pattern, the jury came back pretty quickly and said, ‘the buyer here deserves some relief. The buyer wasn’t treated the way we would want to be treated in the same situation.’ So, it’s significant. “The fact of the matter here, after this ruling, the As-Is Clause is not as concretely strong as a lot of us thought it was six months ago or a year ago. “We know that in certain circumstances you can challenge it in court and we also know, if you read between the lines of this result, that it costs a fortune in legal fees to get everybody to the point of resolution. You could argue, and I’m sure Richard would argue, that everybody lost here, not just the sellers who lost in the jury room, but everybody. Nobody comes away either looking good or whole as a matter of finance. Williams said the Standardbred Horse Sales Company is reviewing its terms and conditions, “and thinking about everything that we have to think about in order to protect everyone in our sale, because we have two sets of customers — the consignors are customers, that was Preferred Equine that the Legges were with, and the bidders are customers, too. We don’t want anybody to get screwed at our sale.